I have read quite a few Robyn Carr books over the years and find her to be a consistently good author of contemporary romance. As often happens I discovered her in an Christmas romance anthology and liked her writing so much that I sought out more of her books and then shared them with my mom. We have enjoyed many of her romances and I'm always happy to return to her books when I am in the mood for a well-written story. 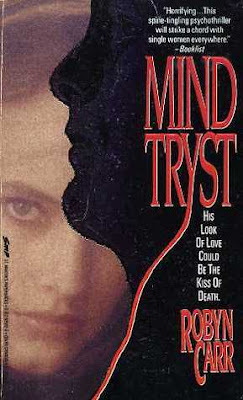 What I didn't know was that Ms. Carr had written a suspense novel, Mind Tryst, released in 1992. I don't remember buying this book, but it showed up in my Audible library so I must have done so. I have been trying to catch up on my older Audible purchases so I grabbed this one as a quick stand-alone while I decide on what I want to listen to next. It was challenging at first, mostly because I never looked at the book's summary before listening to it, so I was expecting a romance and not a psychological thriller. I kept thinking, I don't like these people very much and this isn't very romantic. I especially disliked Tom and thought poor Jackie's background was awfully depressing for a romance, too. Finally, I looked at the summary and got on board with the genre. Now, don't get me wrong, I love a good thriller or suspense novel, the problem was, this wasn't a good one. The book was slow to build and then topped out and dropped down into a long slide. I checked and the book was barely halfway through. It kind of muddled around for quite a long time without any contact between Jackie and Tom. There are endless pages of investigation but no real mystery. There is only one suspect for the villain in this book and he's not very engaging or excessively scary. Things finally come to a close, but the pacing was bizarre and the ending came on with a long-drawn-out sigh rather than a bang. I got the impression the author was as bored with the story as I was and couldn't figure out how to end it. It just kept rolling on and on and on without any momentum. I remember when I was a college student I was waiting for a drive in movie to open so I was killing time. I pulled onto a deserted street and pointed my car down the road and took my foot off the gas. I wanted to see how long it would take for the car to come to a stop. Turns out, it doesn't. Unless you aim it uphill or put on the brake, the car gets just enough gas to keep it creeping forward. That's how this book felt. It just wouldn't die. I don't like writing tough reviews for authors I admire, but this isn't a good book. It's barely a mediocre book. I wouldn't recommend it and I gave it three generous stars.